Ever since Blue Planet 2, ocean plastic pollution has become one of the most talked about topics. And for a good reason: According to Greenpeace, 12.7 tonnes of plastic end up in our ocean every year, harming marine life and humans alike. Experts forecast that by 2050, there will be more plastic than fish in the sea. As packaging design specialists, CuCo are aware of the impact that plastic has on our oceans and we encourage our clients to move away from plastic packaging whenever possible. To raise awareness of the ocean plastic issue, Fairy launched its washing-up liquid in a bottle made entirely from post-consumer recycled plastic, including 10% ocean plastic. The project aims to educate consumers about ocean plastic pollution and the importance of recycling. Another giant brand who have integrated sustainability into their marketing plan is Adidas. 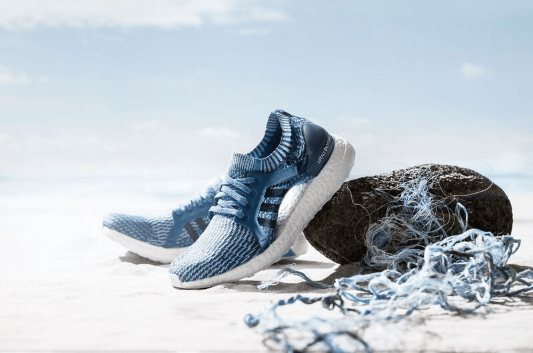 Last year, Adidas launched three new trainer editions – all made from ocean plastic! Each pair is made from eleven reused plastic bottles and the sportswear brand has managed to sell more than one million of these trainers in 2017. This year, Adidas also launched a yoga collection made from recycled ocean plastic. The project emphasises on the importance of recycling and the negative consequences of ocean plastic pollution and is a great step in the right direction! We all love a cold can of beer at the beach on a hot summer day. However, the plastic six-pack rings that hold the cans together are incredibly dangerous for marine wildlife if they end up in the ocean. According to official statistics, millions of animals have died as a direct result of plastic six-packs after becoming trapped in the rings, resulting in strangulation and starvation. Aware of this issue, a small brewery in Florida released an edible and biodegradable six-pack holder in order to save marine life and cut down the amount of plastic waste in the ocean. The 100% plastic free six-pack ring is made from beer byproducts and is safe for animals to eat – what a great innovation! 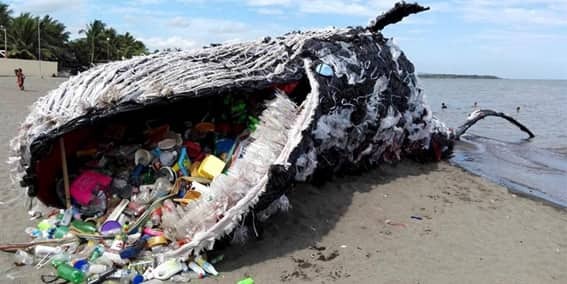 In May last year, pictures of a “dead whale” stranded on a beach in the Philippines with a mouth full of plastic waste went viral and shocked people all over the world. However, what people had mistaken for a real whale was actually part of Greenpeace’s plastic waste campaign. In collaboration with a Philippine-based creative agency, Greenpeace built a giant ‘whale’ made of plastic waste found in the ocean to raise awareness of the fatal effects of dumping rubbish. The campaign was a wake-up call for many consumers and has won multiple awards. Well done Greenpeace! Through the use of powerful imagery, the Surfrider Foundation is working hard to encourage people to reduce their plastic waste with the message that ocean plastic not only harms marine wildlife but also affects human health. Plastic in the ocean is easily mistaken for food by marine animals and more than a quarter of fish were reported to have ingested plastic in 2008 – so what was once our packaging, may be soon our meal! 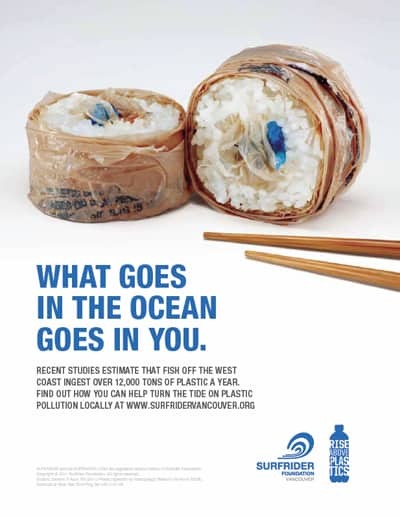 The ad was part of Surfrider’s rise above plastic program to increase awareness of how everyone can reduce their plastic footprint. A highly effective campaign! If you’re looking for sustainable packaging solutions for your product or brand, contact CuCo today on 01202 911959 or email us at hello@cucocreative.co.uk – We’d love to help!